What happens when you combine reality TV tactics with a traditional art collection? This guest post, written by Philippa Tinsley, Collections Manager for the Worcester City Art Gallery and Museum (UK), describes the innovative Top 40 exhibition they mounted in the summer of 2009. 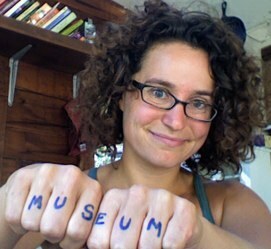 In my experience, museum professionals aren’t big reality TV viewers. If you don’t watch Big Brother, The Apprentice, Dancing with the Stars or X factor you probably dismiss these shows because they revolve around people you don’t know in an environment you find uninteresting and over-hyped. This is, of course, the same reason why many non-visitors don’t come to museums. The secret of reality TV’s success is the viewer’s involvement with the ‘journey’ of the contestants. You are encouraged to develop an emotional commitment to your choice of participant (not necessarily monogamously), learning more about them as they stay in the programme, and in live shows, to support your favourite with your vote each week. This was the main aim of this year’s summer exhibition at Worcester City Art Gallery & Museum, Top 40: Countdown of Worcester’s Favourite Pictures. We wanted visitors not just to tell us their favourites, but to develop a stronger emotional connection to specific paintings in the exhibition (and as a consequence to the museum as a whole during a time of major change). The format of the exhibition was extremely simple – forty ‘star’ paintings from Worcester City Museums’ collection were hung in a visually pleasing layout with no reference to date or theme. Written interpretation about the pictures was kept to a minimum, although we did include family-orientated activity workstations relating to five individual paintings. In the centre of the exhibition we set up a ballot box and voting sheets and encouraged visitors to vote for their favourite picture and, if they wanted to, tell us why. Each Monday morning we counted up the votes cast during the previous week and on Wednesday, the museum released a new Top 40 chart. A fairly large label with this week’s chart position was placed next to each artwork. We also sent out a weekly press release about the new countdown and announced the new number one on Twitter. On the opening day someone wrote ‘About time we had a curator’ in the comments book and I was gutted – I thought the idea had failed. However, by the end of the first week it was clear that the majority of our audience was hooked. Spontaneous discussions broke out in the gallery on the relative merits of different pictures; visitors of all ages came back again and again to see where their favourite was in the chart that week and to cast another vote – at times they were queuing outside before we opened. As well as our existing audience, new visitors came just because they wanted to be part of it. I was particularly pleased to see young children persuading their parents and grandparents to participate. The minimal but family-friendly interpretation from us meant visitors were confident arguing that they liked a picture because it was ‘happy’ or ‘colourful’, but it didn’t hold anyone back - some visitors shared very considered art historical opinions on their voting sheets. In reality TV, producers manipulate viewers’ reactions by shrewd production choices and editing that make boring contestants seem more interesting (see this great article for more analysis on this). I was in two minds as to whether it was ethical to influence our visitors’ commitment towards certain paintings in the exhibition and I’d welcome your comments on this. It was hard to avoid it completely: for example I deliberately chose to link the activity workstations to five very different paintings and this meant Mark Wallinger’s Samizdat (a very intense and quite academic contemporary artwork) probably got more votes because we actively encouraged up close examination. And there was the phenomenon we called the Thomas Creswick Effect: after four weeks of it receiving no votes at all, I wrote a press release about Worcester’s Creswick painting and our local newspaper ran it as an article. The following week it shot up the chart from number 40 to number 14! The contribution of the positive support from our local paper, the Worcester Evening News, cannot be underestimated. They enjoyed being part of the project and reporting the chart each week – it made a great local story. It was clear that their publicity had more impact with our audience than our tweeting and Flickr posts. I believe this local emphasis intensified our visitors’ emotional connection and this was a key part of the exhibition’s success. Staff were very supportive of the exhibition, perhaps because they too have a lot of love for the collection. We encouraged visitors to email us photographs of themselves with their favourite picture and the first pictures arriving in the inbox (unsolicited) were all taken by staff! Our summer exhibition is always a very lively show aimed at a family audience. Within this framework, lots of participation and little curatorial interpretation was not difficult for our staff or visitors. What was unexpected were the positive comments about the format both in the gallery and in the newspaper from very art-informed visitors. We are now actively looking at ways to build on this success in all our exhibitions, although it’s a much bigger challenge in touring or artist-curated shows. Just like live reality TV, Top 40 felt like a risk at times. It was relatively low budget, but unlike most exhibitions took a lot of curatorial and technical staff time during the exhibition’s run. It could have gone badly wrong: a larger proportion of our audience (and our peer group) might have considered our interpretation strategy as dumbing-down or a demonstration of the museum’s curatorial ignorance. Or our visitors might have become bored and we could have lost that valued connection before the exhibition ended. But in reality, the exhibition format really worked, both for the participating visitors and for the future shape of Worcester City Art Gallery & Museum. The challenge now is to take that audience connection into the next step of the museum’s organisational development. Philippa will be checking in to answer any questions you might have in the comments here on the blog. I'm on vacation this week and will join the conversation when I return! How did you decide on the "star" paintings? I wonder if there would have been a way to involve a small committee of the public in the actual choosing of the Top 40. Based on the reactions you got, do you think that would have made it even better, or not really made an impact? For Top 40, I selected all the pictures we included. I gave myself a few rules: only one picture by each artist; select artists who have a high profile where possible; aim for a wide diversity of media and styles. In common with other museums I've done exhibitions selected by different local groups in the past and I've always found it a very positive experience for both the museum staff and the participants. From a curator's point of view it really opens your eyes about some of the items in your collection to work with an exhibition curator who comes into the process with a completely different perspective. You have a very intensive process with a few people in a project like that. We chose not to combine that approach with the continuous voting process in Top 40 for a few reasons. Firstly because we were essentially asking people if they agreed or disagreed with our original choioces which means as the exhibition curator you have to be prepared for people to disagree (sometimes very strongly and ocassionally in person) with your choice. I was very objective and not precious about my original Top 40 choice, but I would be less happy about imposing that on visitor curators who might take the reaction personally. Some visitors to the exhibition actively enjoyed disagreeing with the authority figure of the 'curator' - they might have felt less free to be so vocal with visitor choices. Secondly, I think that reality TV is again a good guide here - producers deliberately chose a mix of contestants to provoke a reaction. I think intentionally choosing a wide selection of both very traditional and very contemporary artwork helped stir the debate. Good points all--thanks for responding! I think this exhibition was a fabulous idea. This is a really engaging project. Do you think it attracted new audiences, and did you have any way of measuring that impact? We've got fantastic comments on the voting sheets such as 'I've not been to the museum for 30 years and I was so pleased to see this painting again'. We're in the the middle of coding these comments at the minute. We code to a system of learning outcomes used in the UK called Inspiring Learning for All which is very helpful for this, particularly in comparing the impact of different exhibitions. Anecdotally (i.e. from our incredible experienced desk staff), we know people came who hadn't come before. But, honestly, no we don't have perfect evidence! We're a free entry museum so we don't capture information about every visitor. We do do regular visitor surveys which are really useful to get a sense of how often and who are visiting, but obviously these only happen from time to time (and didn't this summer). Actually I think the concept of knowing about your visitors vs intruding into their visit with an interviewer and a clipboard is an interesting issue. In an ideal world I'd have found a way encouraging engagement that meant we gathered visitors postcodes too - anyone got a great idea of how to do this? Here at the Postal Museum in DC we often use "vote for the most gorgeous stamp" or "the wackiest way to deliver the mail" to encourage visitors' looking at objects closely and discussing them during public programs. These short-lived rounds of voting (available on-site for only a 3-4 hour program) offer a low-commitment moment of interaction and education for adult visitors who shun "activity tables" and markers. We never used to announce the results of the vote because we only thought of it as a teaching tool. But then visitors insisted that they needed to know which stamp won so we started announcing results on Facebook and allowing online votes, too, which has really upped the interaction factor. People love being asked their opinions! Besides tweeting and using flickr, what other online components were used? This exhibit begs for a dramatic video preview or teaser! we didn't use anything else online but you're absolutely right, it would make a great viral teaser!